Born on 30th January 1882 to Sara Ann Delano and James Roosevelt, he was raised in a wealthy family of international traders and real estate business men. His parents of English origin had him as an only child. Their family’s frequent international travel exposed FDR to the global environment making him well versed with German and French. A skilled long hitter, he had different sporting abilities in shooting, polo, golf, lawn tennis, sailing and riding. Educated in Christian schools, he learnt Christian values and principles, which guided and influenced his adult life. Trained as a lawyer in Colombia Law School, 1904, he pursued corporate law under the prestigious firm Carter Ledyard in Wall Street. Married to Eleanor Roosevelt in their 20s, they had six children. Mentored into politics by his fifth cousin President Theodore Roosevelt he joined politics in 1911 as a New York State senator. He was also a member of the Free Masons since 1911. He then became popular nationally through his political tactics among the New York Democrats. He also had an opportunity to serve under Woodrow Wilson’s administration in 1913. He later served as Assistant Secretary in the Navy and ran unsuccessfully for vice presidency in 1920. Between 1929 and 1932, he served as New York Governor in which he brought about numerous social reforms to become popular in most populous states. This opened the door for his presidential bid success in 1933. 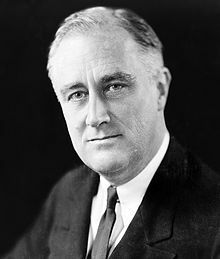 Franklin D. Roosevelt foreign policy of 1933 to 1937 saw the rejection of the League of Nations treaty to bring about an isolation period in world organizations. He was against imperialism and trade oppression and his efforts contributed to the end of colonialism. He advocated a “good neighbor” policy in his first term rule. His third term rule between 1941 and 1945 saw the events of World War 2 unfold. He began the rearmament and he stood up strongly against the Axis powers. He had a twin policy of preparedness and aid to the Allied coalition. This was adversely criticized as double standards. When the Nazi Germany invaded Soviet Union in 1941, he gave financial and military support. Later in December that year the Pearl Harbor, attack ensued and the US took up support for allies to end war in the Pacific. FDR was part of the war strategies by the Big Three (Roosevelt, Churchill, and Stalin) to defeat their enemies. As the US sought to align itself in the war, Franklin Roosevelt gave diplomatic and financial support to China and Britain to counter Japan and Nazi German. The US was to remain neutral in the war. FDR is also popular for his counter attack on the US foes Japan and Germany in the Pearl Harbor attacks of 1941. He had a great impact in the administration of the United Nations and Briton Woods institutions through his diplomatic influence. Although the institutions came up after his death, his diplomatic ideology contributed a great deal. The US would remain neutral but spearhead democratic principles through its support of allies. His ideology was focused “a little left of center”. He died at 63 in April 1945 at after a long battle with numerous illnesses.